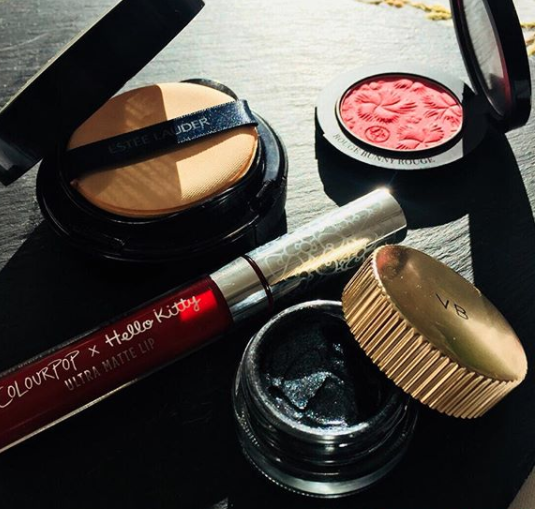 Estee Lauder and Victoria Beckham have a rather sleek and select edit of makeup that appears over the seasons, last year I totally ignored the fuss, this year I decided it was time to delve if you don't try then how can you have an opinion. VB Autumn/Winter edit repeats on certain items from last year but, also has some added extras. 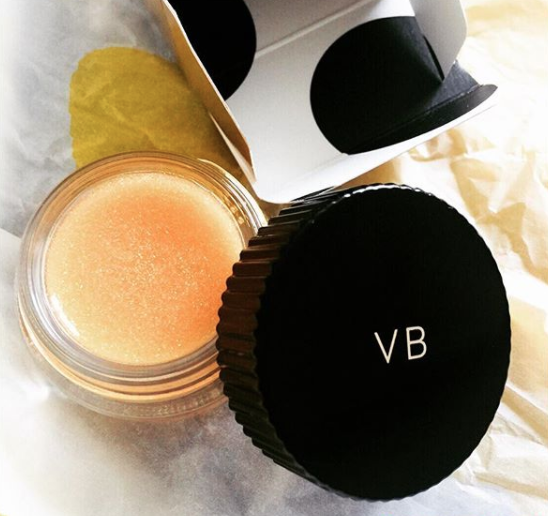 VB Aura Gloss in the shade 01 Honey, the packaging is simple, chic and refined, the product title has the larger font, cleverly pairing back on the celebratory connection. I particularly like the box innards that house the product, black spots which make it fun, yet, still very chic. The little pot is cute, glass with a plastic lid, this cries out for a metal lid, something with substance, the plastic cheapens the product. 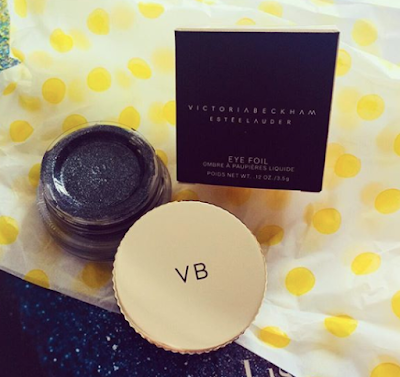 I like the VB initials on the lid, again, paired back but, cleverly Victoria is never far away, just a hint here and there. Once revealed, the honey aura looks shimmery, nothing particularly distinctive, it could be a pot of lip gloss or cuticle cream, there is nothing breathtaking. The product is a hard gloss, subtle, with no scent to it at all. My immediate thought was 'this is an expensive Vaseline with flecks of gold', not tacky to the touch and easily placed, you do have more control with this as a product, it doesn't move or slip as such. The sheen is subtle, it gleams softly but doesn't shimmer and gives a soft hue to high points of the face. I do like the finish and softness of the highlight, it's a healthy glow without any stark glitter reflecting the light. The Eye Foil I really love, presented in the same way as the Aura Gloss, it comes with a protective lid also, essential as this product has movement, but, pleasing not on the lid. This is a delicately creamy consistency that feels slick when applied to the eye and yet, you feel it change and almost attach to the lid. I adore the delicate finish and the buildability, it has a shimmer but also the depth of this Burnt Anise shade is just stunning. Easy to use with a dual fibre brush beneath the eyes, I have found the easiest application on the lid and beyond is using my ring fingers, they blend the product and also pat it easily into place. Without using an eye primer I applied this directly to my eyelids and pushed the colour upwards towards the brow bone. 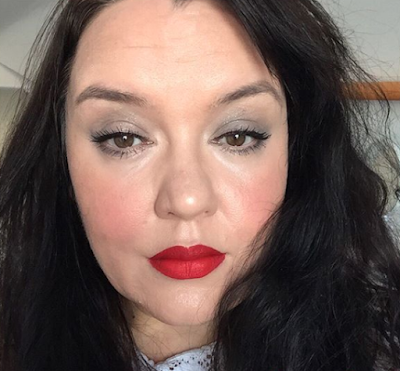 I did find it collected in the crease after a couple of hours even with a minimum amount applied but it didn't transfer to my brow bone area, one of the joys of droopy lids are the transfer lines from certain products, often eyeliners. I like the grungy look to this when it does collect and it's very much a Jack Sparrow shade, think posh pirates. I am wearing a minimal amount of eye foil in this photo, to show that it doesn't have to be full on and heavy with the shade. I prefer the Eye Foil over the Aura Gloss, which is pretty and subtle but, could be achieved with many other products. The eye foil is a consistency I haven't come across but has a grip when applied, both are presented to a high standard, costly for what they are but, with a celebratory name attached it tends to be the rule of thumb.